An individual acquires domicile of origin at birth. Their domicile will not necessarily be their place of birth, but rather the domicile of their father (or mother, if their parents were not married at the time). Until an individual reaches age 16, their domicile will follow that of the person on whom they are legally dependent. If a parent becomes a non-UK domicile, so will their child. Taxpayers who are both UK residents and non-UK domiciled are unique as they can elect for their foreign income to be taxed on a remittance basis. This means that any foreign income they receive will not be UK taxable unless it is brought back to the UK. If the foreign income is brought back to the UK, it will be taxed in the UK at non–savings income rates (20%/40%/45%), including foreign interest and dividends. A new claim needs to be made for every year that an individual wants their foreign income to be taxed on a remittance basis. If an eligible individual opts for their foreign income to be taxed on a remittance basis, they will not be eligible to claim either the personal allowance or married couples allowance for that year. Generally, if your foreign income is in excess of the personal allowance (£11,000) it would be more beneficial to elect to use the remittance basis. This will not affect those individuals with income of £122,000 or more, as are not entitled to the personal allowance. There is a charge for individuals who elect to use the remittance basis when they are long-term residents. The remittance basis charge will be payable through the self-assessment tax return. 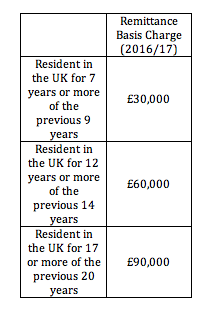 If the amount of income being remitted to the UK is less than £2,000, the remittance basis will apply automatically. In this case, the individual will be exempt from the remittance basis charge and will also be entitled to the personal allowance and married couples allowance. Overseas Workday Relief allows UK employees who earn income from duties performed wholly/partially overseas to have the resulting earnings taxed on a remittance basis. OWR can also be applied to a split tax year, although it will only affect foreign earnings that relate to the part of the year when the individual was considered a UK resident.